The house has the broad eaves, overhanging hipped roof and decidedly horizontal massing of the Prairie School. 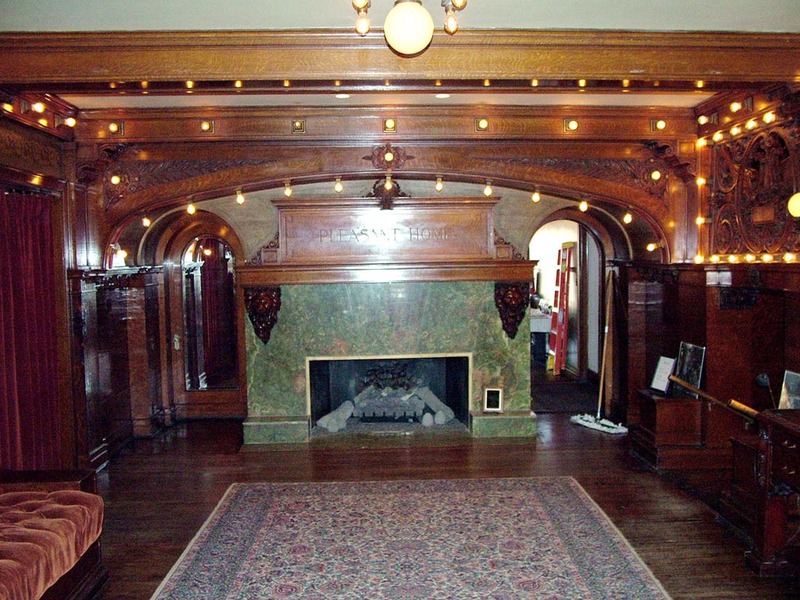 It also has urns flanking the entrance and is centered on the hearth/fireplace, a device Wright also used. Both Wright and Maher had worked together in the office of Joseph Lyman Silsbee, who developed very sculptural proto-modern compositions in the Shingle Style, which emphasized continuous surfaces, one of the often-overlooked but essential markers of the Modern. Maher started his own practice several years before Wright, and admittedly was more conventional in his compositions, employing a rhythm-motif theory whereby key elements – in Pleasant Home a shield, a tray and a lion – were repeated in stone, wood and stained glass ornament. 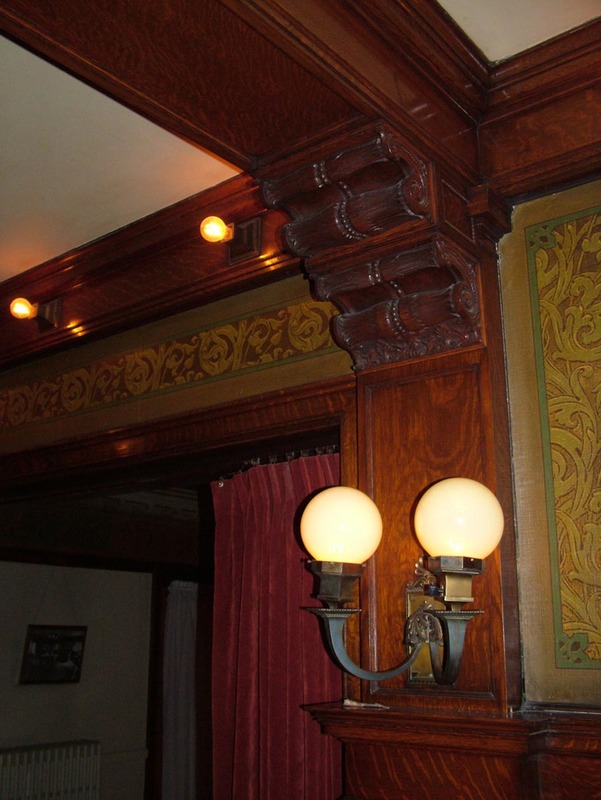 Like many early Prairie homes, Pleasant Home was a large house for a wealthy client – John Farson – during the dawn of the Progressive Era and the American century, when business people wanted to appear forward-looking. Modernity aside, it was a big, fancy house. 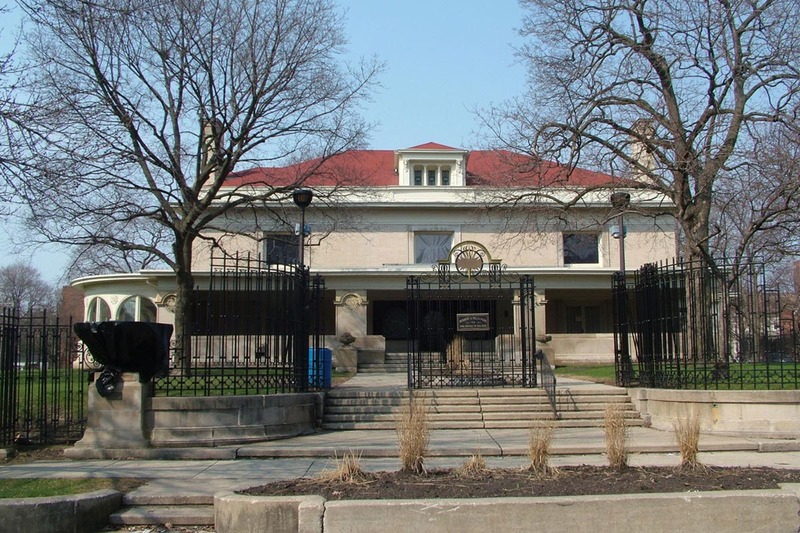 It passed to the Mills family in the early 20th century and eventually to the Oak Park Park District in 1939, and over time senior activities were organized on the lower floor while the Historical Society of Oak Park and River Forest occupied the upstairs. 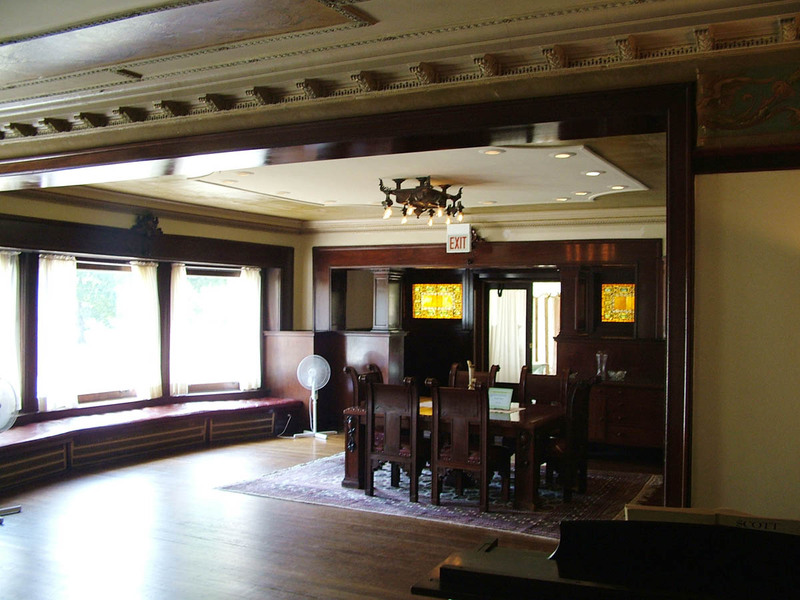 In the 1990s Tony Jones and others crafted the Pleasant Home Foundation to operate the house as a museum, although it still gets only a fraction of the visitors who come to see the Frank Lloyd Wright Home and Studio a half-mile to the north (on the same street!). So I have lectured there and brought groups to the house under the previous Director, Mary Beth Blattner, who had the house listed as a National Historic Landmark, and the current one, Laura Mercier Thompson, who just got a letter from First Lady Michelle Obama announcing that Pleasant Home had become one of the newest stewardship sites of Preserve America, a national program administered by the Advisory Council on Historic Preservation. It is a big deal, one of a couple Executive-level programs, along with Save America’s Treasures, that recent Presidents have instituted. I have been pleased to be involved a little with the Restoration Committee at Pleasant Home, and our students did HABS drawings of the house back in 2000-2001. I recall one time when the library restoration was being discussed and we were trying to determine whether a certain lamp was from the Farson era or the Mills era, and Kathy Cummings (the expert on George Washington Maher) and I noticed a calendar on the wall in an undated photo, which we were able to use to determine the date of the photo and help guide the restoration. It was a fun “detective” moment. 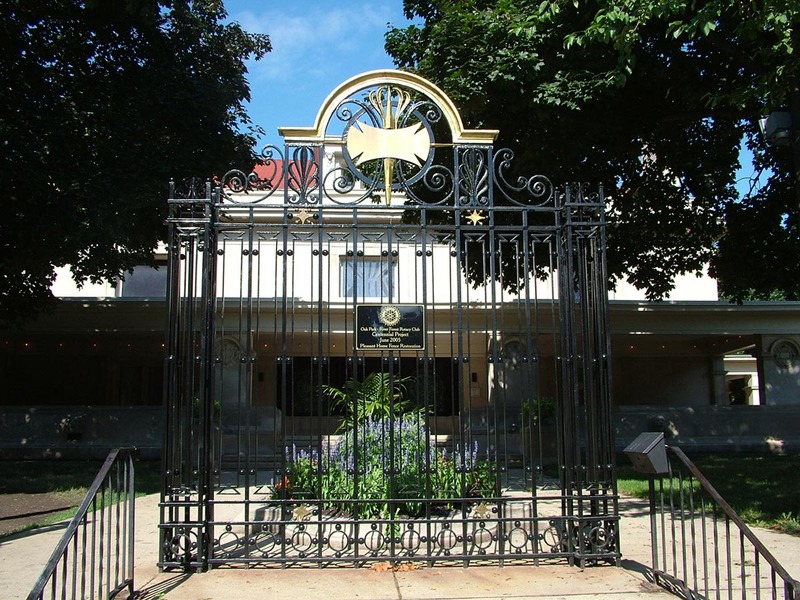 Another moment occurred five years ago when the front gate was being restored at a metal shop in a nearby suburb and architects John Thorpe, Frank Heitzman, Leslie Gilmore and I were looking at the proposed “shield” pattern for the crown of the gate and realized it did not match the photo. John sat down on the floor of the shop and sketched out the correct pattern. I have been too busy the last couple of years to participate much with the Restoration Committee, although they did bring me back last summer to give my old “Wright and Maher” side-by-side slide lecture. But you should visit – it is a half block from the train line (Metra and CTA) and now it is most deservedly a Preserve America Steward. The big news this week was an effort to preserve Frank Lloyd Wright’s Bradley House in Kankakee, one of the epochal early Wright Prairie Houses. Blair Kamin did a bangup job of covering the issue in the Tribune here. A local Wright in Kankakee group is trying to raise money to buy the house and make it a house museum and education center. The bottom line is the $1.9 million price and the more immediate concern of an additional $100,000 for the down payment beyond the $70,000 already raised. I can recall when the house was law offices and Kamin’s article notes that the owners for the last 5 years, the Halls, have been ideal, keeping it together and restoring it. 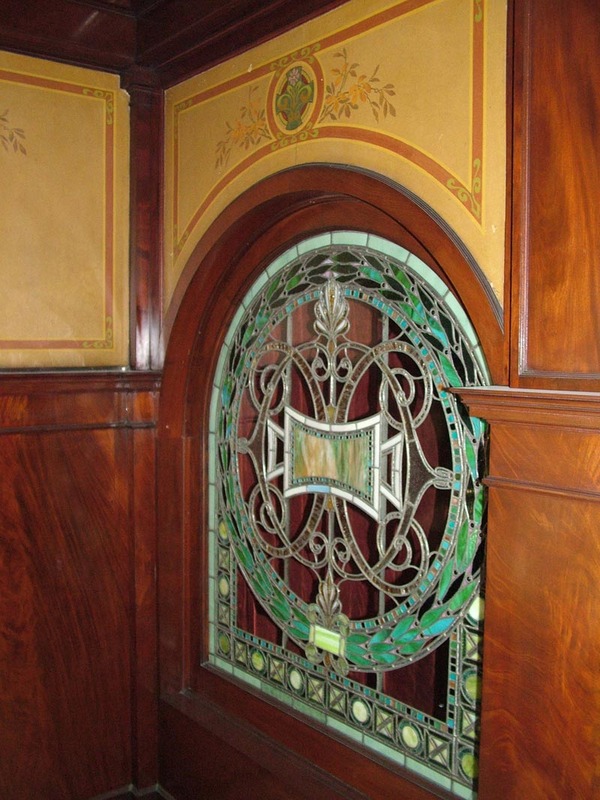 With 100 art-glass windows, the house could be worth almost as much in pieces as it is put together. The real challenge is not simply the purchase price, but the ongoing operations, since house museums rarely generate more than a quarter of operating costs from admissions. The Bradley House either needs an angel to subsidize the purchase and an endowment, or it needs more angels like the Halls who will care for it as the treasure it is. My other news clippings this week included a plan to restore the iconic 1957 Inland Steel Building using the Cook County Class L landmark tax incentive, which basically halves a commercial building’s tax liability for a decade. What’s the catch? It has to be a locally designated landmark and you have to spend half the value of the building on the rehab. The announcement came just days after the death of Bruce Graham, the Skidmore, Owings and Merrill architect who designed the building, or rather, completed the design that Walter Netsch had started, making the building a rare collaboration between the two SOM protagonists. 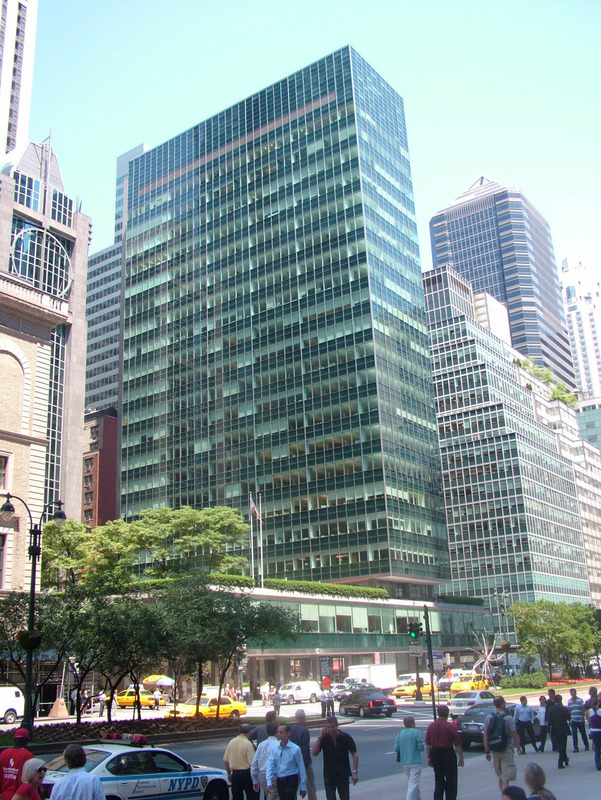 Inland Steel has a fascinating landmarks history. 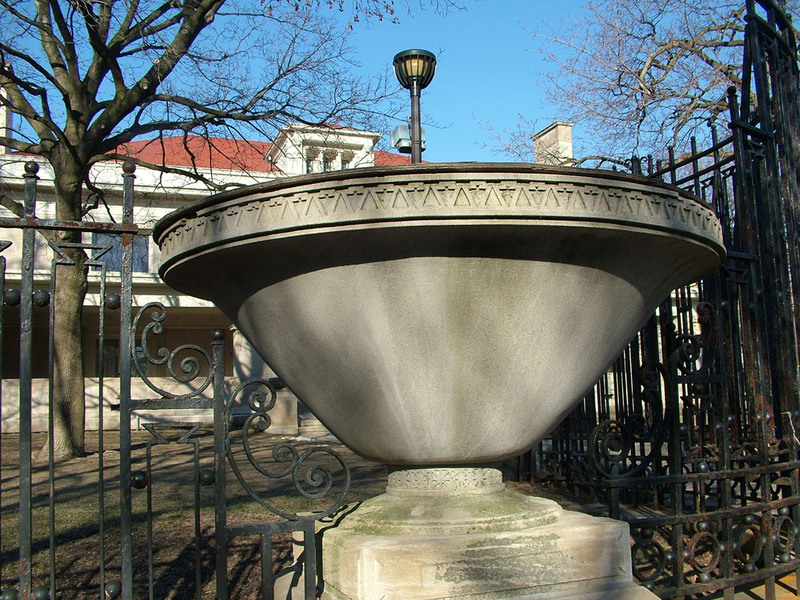 On a flower planter near the Monroe entrance you can find a 1960 plaque from the first, toothless 1957 Chicago Architectural Landmarks law, an add-on to the famous zoning ordinance that doubled the city’s density. 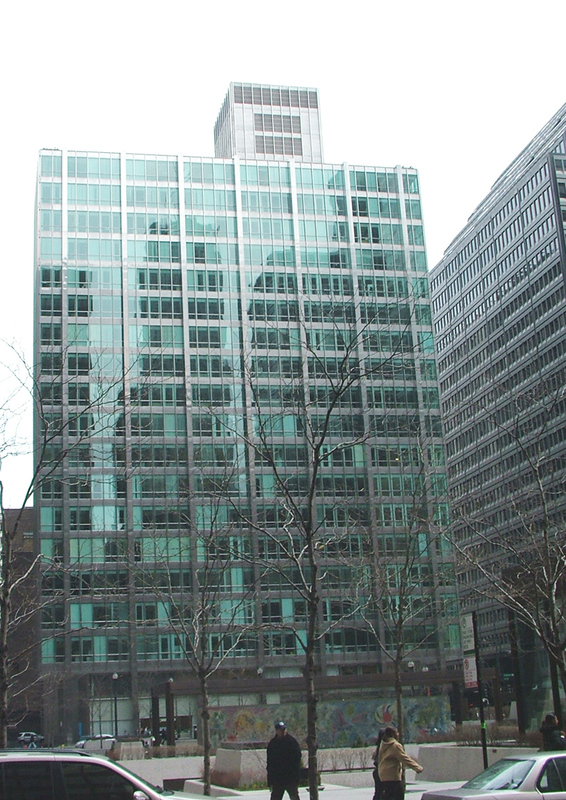 Inland Steel was included in “Chicago’s Famous Buildings” and considered a Chicago Landmark WHEN IT WAS BRAND NEW! 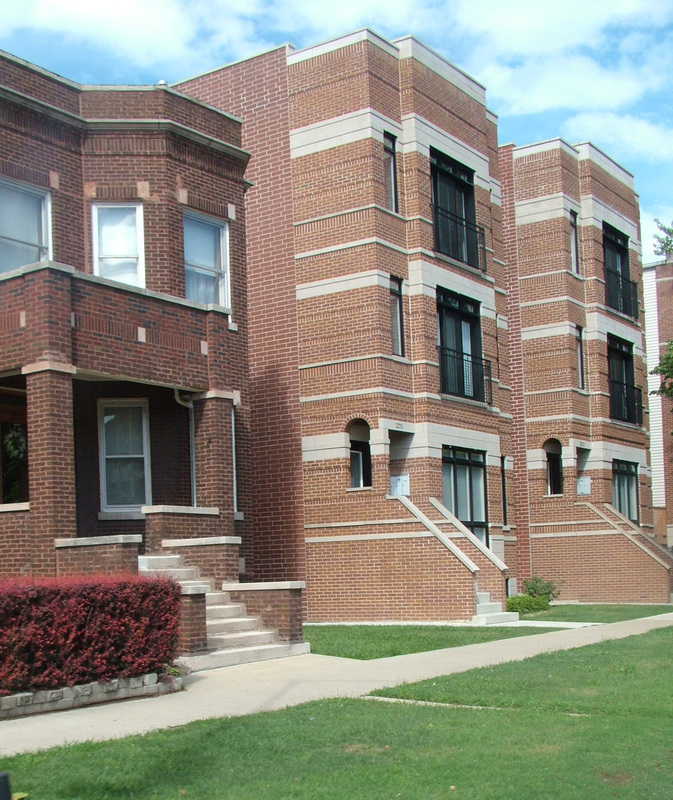 It epitomized the structural bravado that seemed the salient characteristic of Chicago School architecture, carrying its steel frame on the OUTSIDE and creating completely open floor plans serviced by a separate, windowless tower than contained all of the functional necessities. It is such an icon modern starchitect Frank Gehry is a partner in the building and has designed a new desk for the lobby. 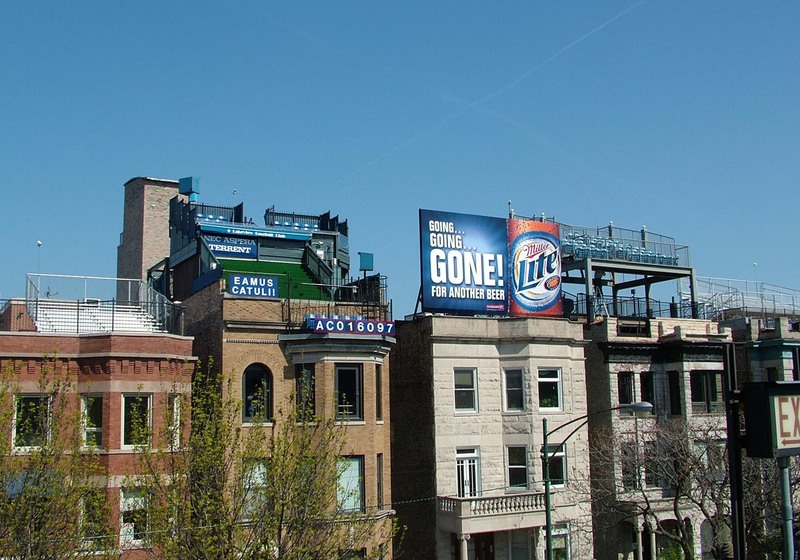 Finally, Wrigley Field announced it wanted to put up a giant illuminated Toyota billboard above the left-field bleachers. What can I say – Toyota and the Cubs: what a co-branding opportunity! Two teams you can trust – until September comes! Don’t put the brakes on the Cubs season! As if Toyota wasn’t enough of a target for regulators and Congress, now it is going to be a target for MLB sluggers? 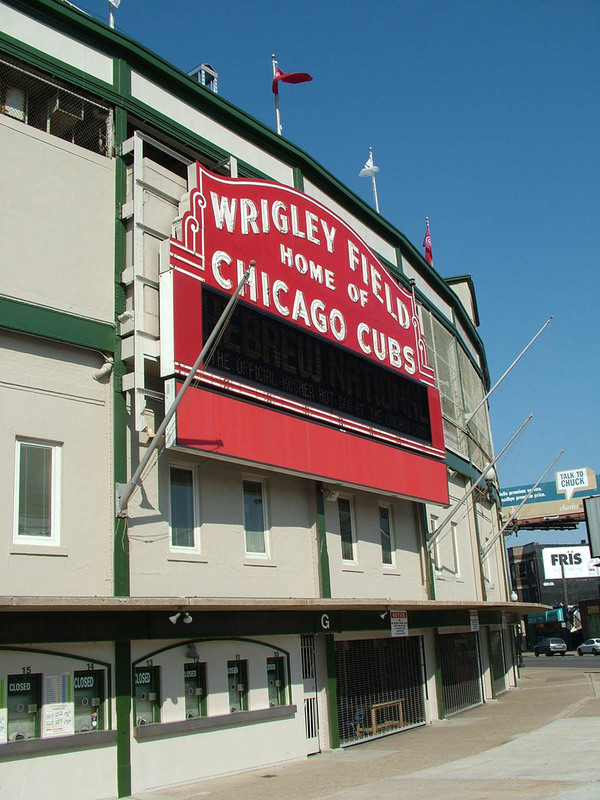 All joking aside, Wrigley Field is a landmark and the signage would presumably have to be approved by the Commission on Chicago Landmarks. It is a big sign, and it is structural. 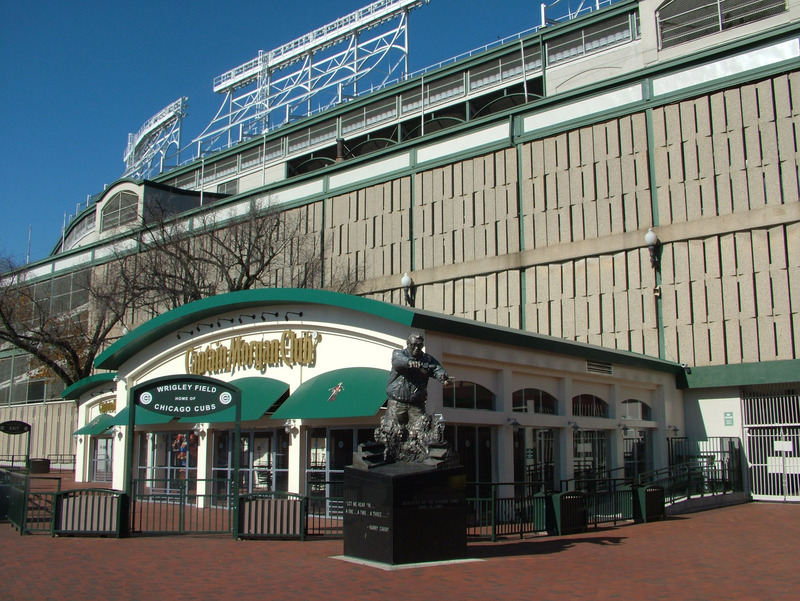 There are plenty of other signs in and around Wrigley Field, so the question is not whether a sign would be allowed but what kind of sign and how big. 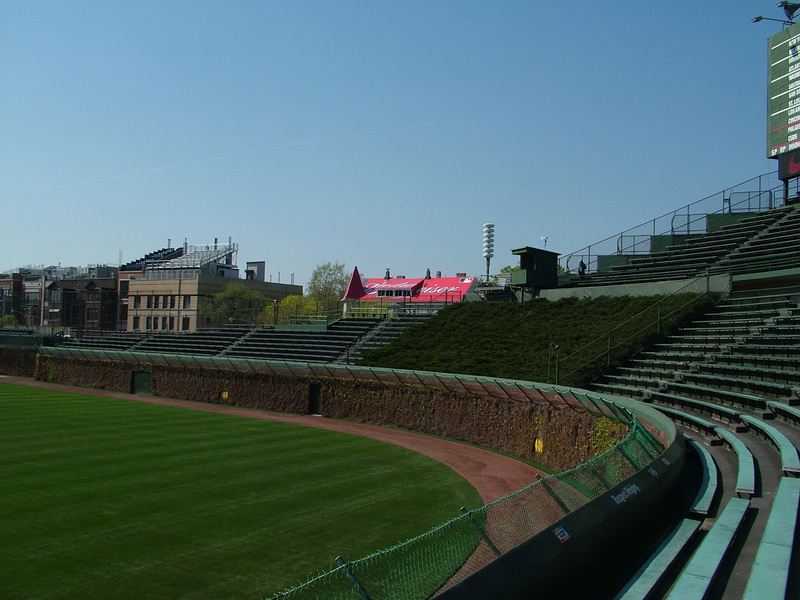 Also, Wrigley has had a fair amount of changes approved by the Commission, including an addition in the bleachers that reached out over the public sidewalk at Waveland and Sheffield Avenues and the new club building that appeared last year on Addison. Paul Byard sadly passed away but Steve Semes has finally put many of his ideas about the value of traditional architecture for new construction in and around historic buildings into a new book, The Future of the Past (Norton, 2009) and he spoke and led a discussion today at SAIC. It was fascinating and stimulating and I can’t shut up about it. His lecture asked WHY we preserve and analyzed the motives for preservation, which include the historian’s motive of buildings and places as “documents of their time,” the populist motive of “places we love and want to keep,” and the most forgotten motive of all, “to learn how to build.” That latter one has often been anathema even (especially?) in architecture schools, where creativity is seen as the opposite of context. In this blog I have often written that it requires more creativity to deal with an existing context than to start from scratch, so I agree with Semes there. I also agree with a really important issue he brought up in regard to historicism, which is sort of the traditional 19th century concept of history: it starts, it progresses, it changes and it sort of follows a logical trajectory. If you look at my website you know I am convinced that the beauty of history is that it doesn’t start, it doesn’t progress, and it is – like all truths – rarely pure and never simple. It is a big mess all of the time that only gets messier with time and that is its mystery and beauty. So Semes had me there as well. And here is where he makes his big point: Why in following the Secretary of the Interior’s Standards do we insist on “contemporary” design for additions and infill? Why do we require architects to create a discontinuity of style between old and new? Standard #3 requires additions and new constructions not “create a false sense of history” and Standard #9 requires additions to be compatible with the original but differentiated. Semes is upset with stark modernist additions to buildings in traditional styles, and blames it on the interpretation – and to a lesser extent the wording – of these standards. 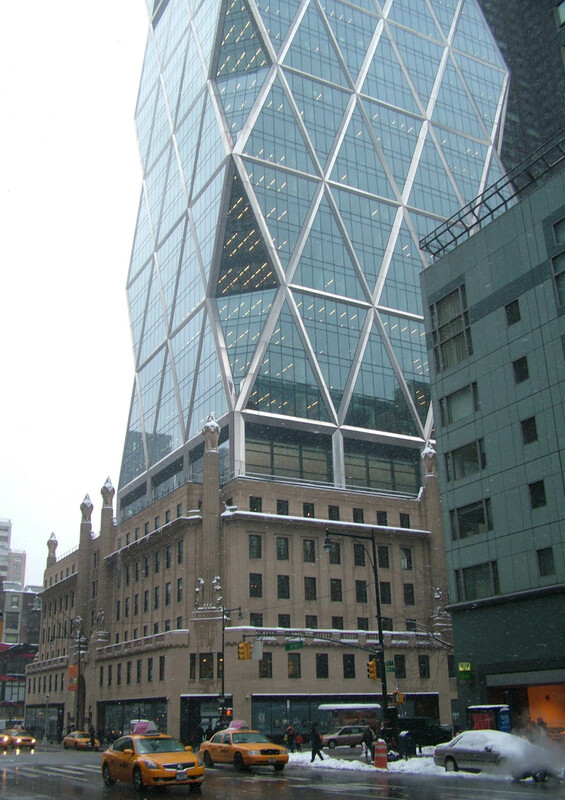 The Norman Foster example above in Manhattan is a good example of what he is fighting, and he asks – as he did 4 years ago – why don’t we allow traditionally style additions to Modernist landmarks? Fair point. 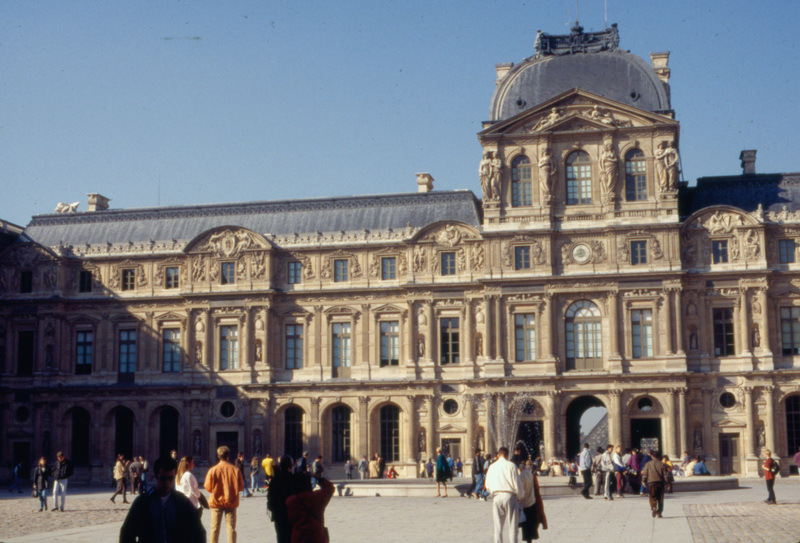 I told him I sometimes like the more contemporary additions, but he is right in his book at outlining a series of strategies for additions that range from rupture (Soldier Field) to absolutely exacting imitation (Cour Carree in the Louvre). 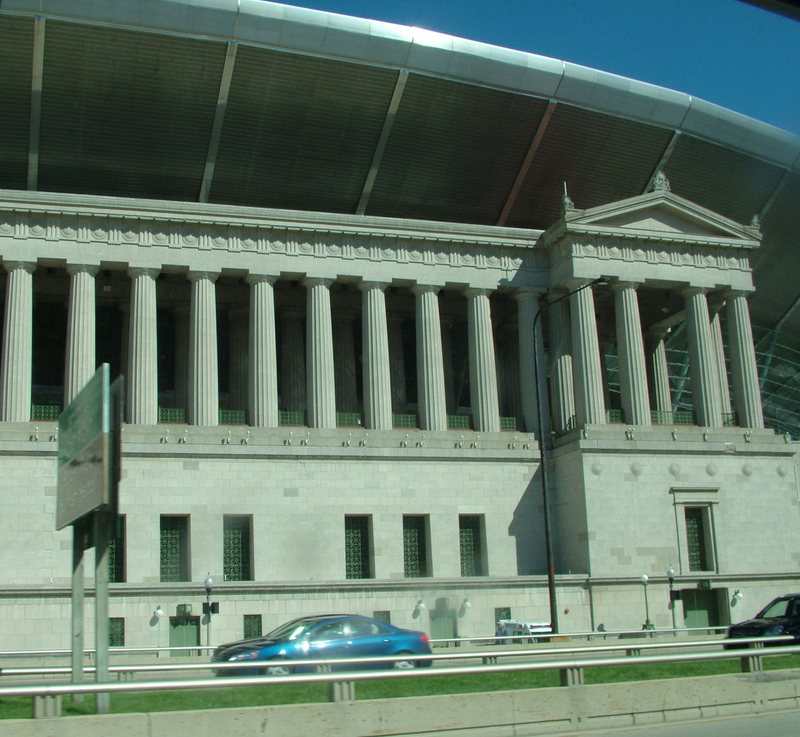 We allow the ruptures – although we pointedly did not at Soldier Field, which lost its landmark status – more often than the continuities, says Semes. Semes is also right about history, and we need to understand that every style is a style and every architecture is “a product of its time” because there is no single narrative. High modernism is already being revived in Dwell magazine and elsewhere, and the restoration of the Lever House is almost as much of a recreation as the reconstruction of the Governor’s Palace in Williamsburg was 70 years ago. So what if they are different styles? I chatted with him later about some of the foibles of high modernism, which was a very historicist movement, not in a fashion or stylistic sense, but in the Hegelian sense of seeing history as a dialectic and a narrative. High Modernism was incredibly optimistic and egoistic because they saw all of history except themselves – they had the hubristic attitude of being outside history: being its conclusion or culmination. is preferable to exaggerating the discontinuity. 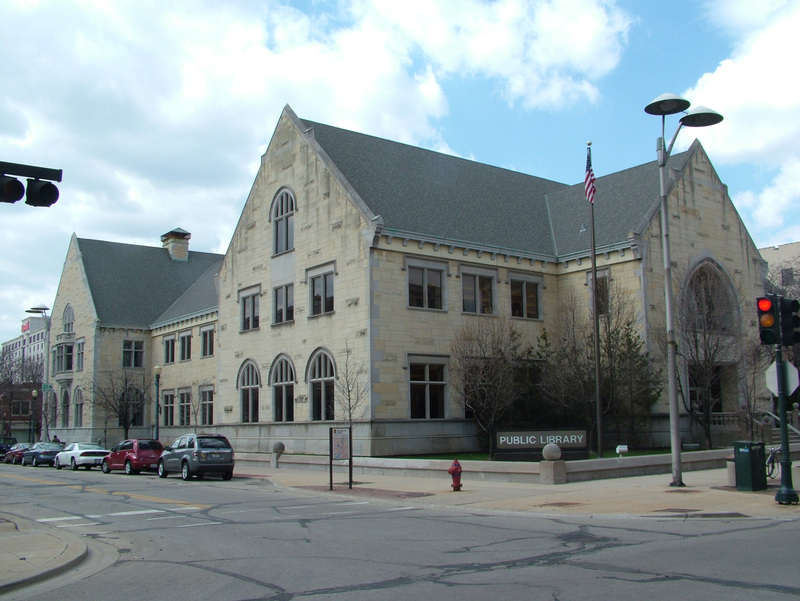 I showed him this 1990s addition to Daniel Burnham Co.’s Joliet Public Library and offered that in the 1990s we started to see traditional additions to historic buildings in spite of the tendency that Semes has identified as a problem. Contextual additions are much more prevalent since 1990 than in the previous quarter-century, although Modernism is still granted a funny space outside of history even as it too has become a revival style. I have said it before and I will say it again: you can make two mistakes in looking at the past: one is to assume that people then were smarter than now. The other is to assume they were stupider than now. 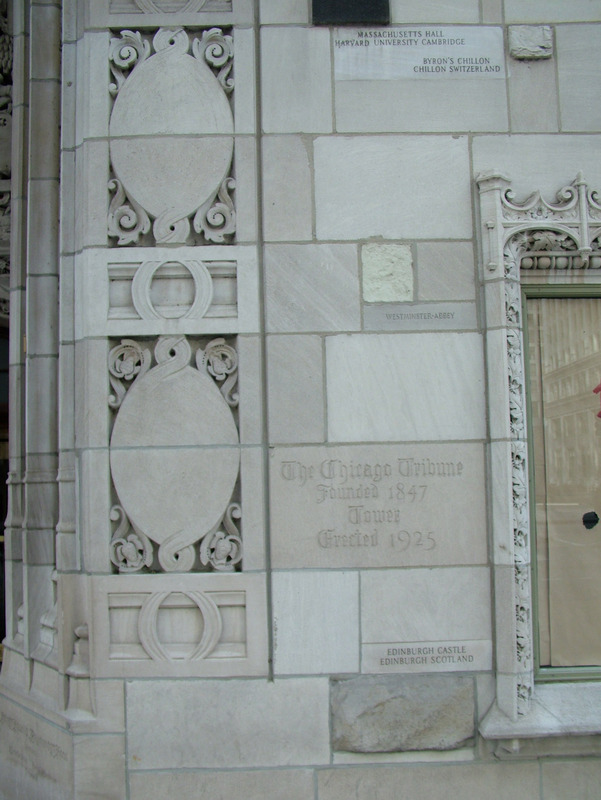 The fact is they were people living a life as inchoate and contradictory and aspirational as our own, and yes they had technologies but the fact is the Tribune Tower is more technologically advanced than the Auditorium and that has nothing to do with Gothic buttresses or Romanesque arches. We tend to judge books by their covers despite all the warnings to the contrary. I also think we need to tweak the Standards. One of my favorite quotes from Semes had to do with arguing against the Standard that tells you not to create a “false sense of historical development.” Semes responds that there is no such thing in architecture as a false sense of historic development. If it was built in 1924 and it looked like a refrigerator or a Jacobean castle or an elephant or a Renaissance manor house or a log cabin, IT WAS STILL BUILT IN 1924 really. There is no one “true” history of architecture – the 20th century was not simply the rise of modernism. And neither does the 21st century have a singular style or singular narrative. Time does keep everything from happening all at once, but that doesn’t mean it only writes one story. Again, I like some disruptions and I love my modernisms in all of their variety. But I also value something that we have been holding dear at the National Trust as we lean into the preservation of the recent past and modernism: a lot of pre-1930 buildings were built really well. They are more energy efficient and sustainable and durable than anything built in the second half of the 20th century and likely more durable than many buildings built today. And that is why Semes point about preserving a culture of building and preserving buildings SO WE CAN LEARN HOW TO BUILD was the most revelatory comment he made today. This not only takes us beyond the archicentric and modernist tendencies of the Venice Charter and Secretary of the Interior’s Standards – it incorporates the sense of traditional culture and traditional building and cultural definitions of significance and stewardship that have modified Venice since the Nara Document of 1994 and subsequent revisions that have made our conservation project more conservation oriented and less preservation and restoration oriented. More than simply asking us to revisit architectural standards for preservation, Steve Semes asked in his presentation and his book that we look at preservation as heritage conservation in the broadest, most ecological sense. It is not about style and it is not about rules. It is a process and it is a loving care of tradition, or whatever it is we want to label that connection every culture makes between the past and the future. 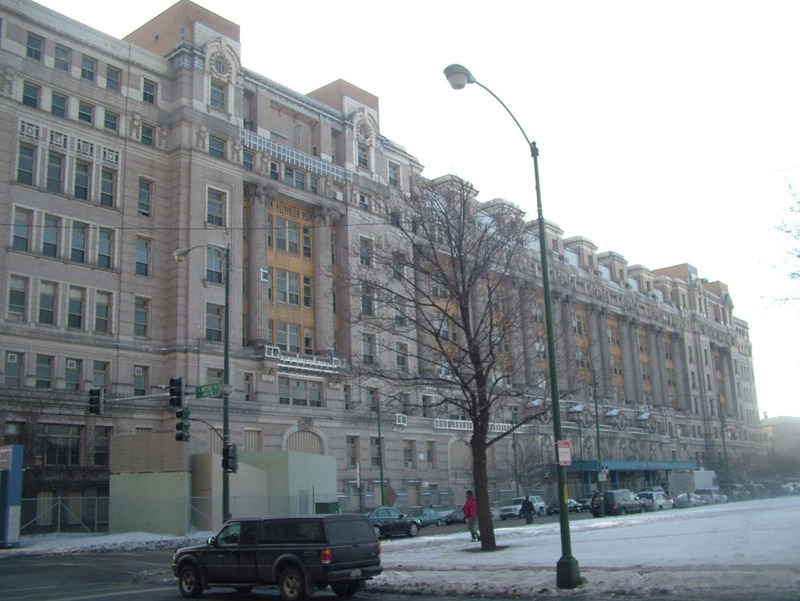 In Chicago today the news is the unanimous decision of the Cook County Board to rehabilitate the historic Cook County Hospital Building (1914, Paul C. Gephardt) as medical offices. 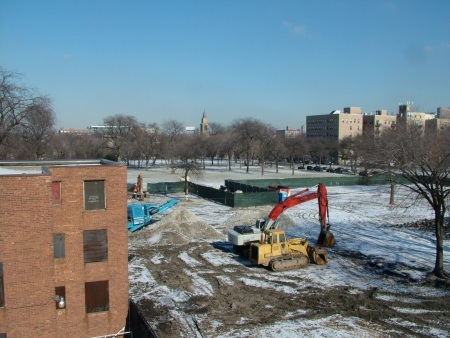 Seven years ago the building was to be demolished after the new John Stroger Hospital replaced it, but Landmarks Illinois and Preservation Chicago and others were able to find enough County Board allies to prevent demolition, and the unanimous action yesterday illustrates the shift. 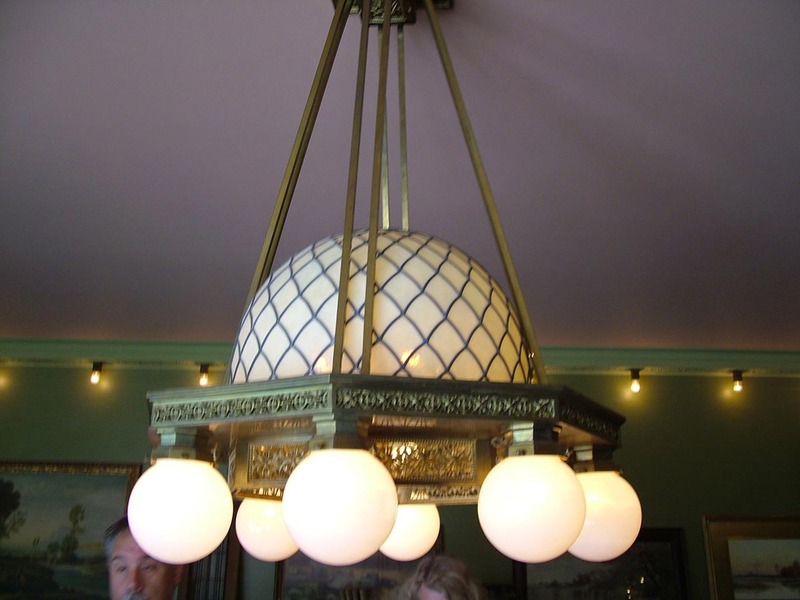 The project also ably illustrates several intriguing aspects of rehabilitating historic buildings. First, there is the associational aspect. While the hospital had several historic firsts: blood bank; indigent care, certain emergency room procedures. 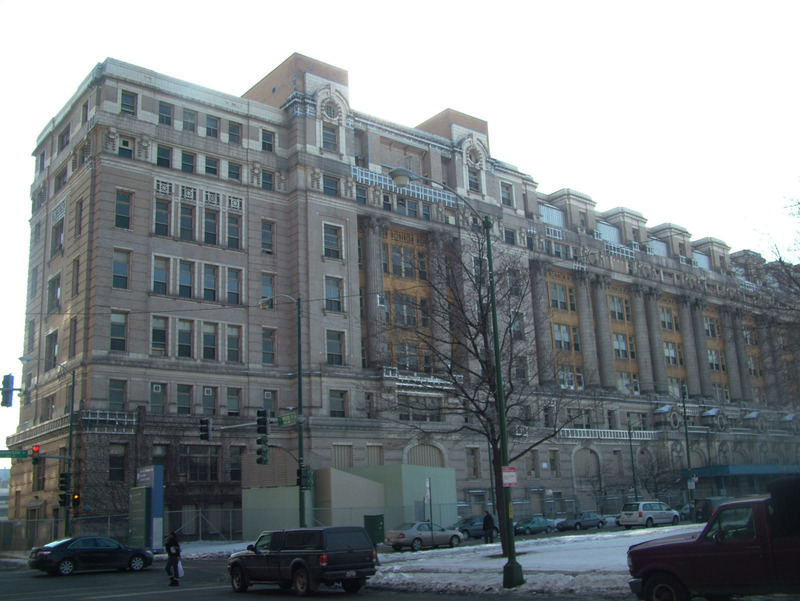 Yet many people of course had very negative memories of the hospital since it was the medical last resort for so many of the most indigent for so many years. I remember going there in 1983 to see a friend who had gotten his head cracked for supporting Harold Washington’s mayoral candidacy. It was not an environment to elicit enthusiasm, but it wasn’t as bad as I expected, having grown up with horror stories of the public hospital. What is intriguing here is how the negative associations are translated into a push for demolition. 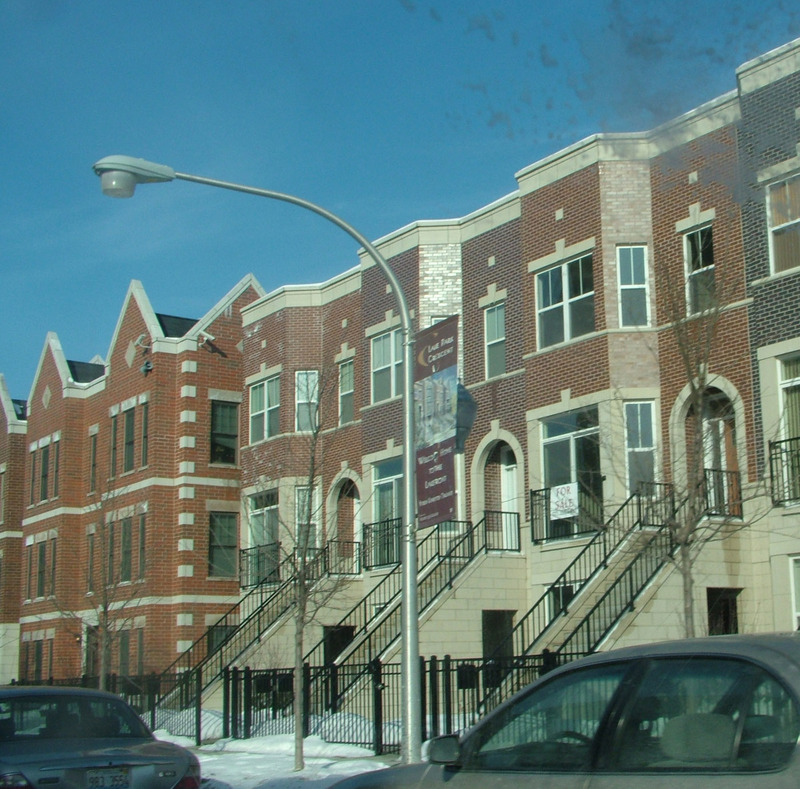 We got similar reactions in the effort to save one of the Jane Addams Homes, replete with the negative association we formed of public housing in the 1960s and 1970s. But of course we toured the homes with people who had lived there in the early, glory days of public housing, who had nothing but positive memories of the place in the late 1940s. The problem with negative historical associations is that they can be employed to demolish an otherwise beloved place. 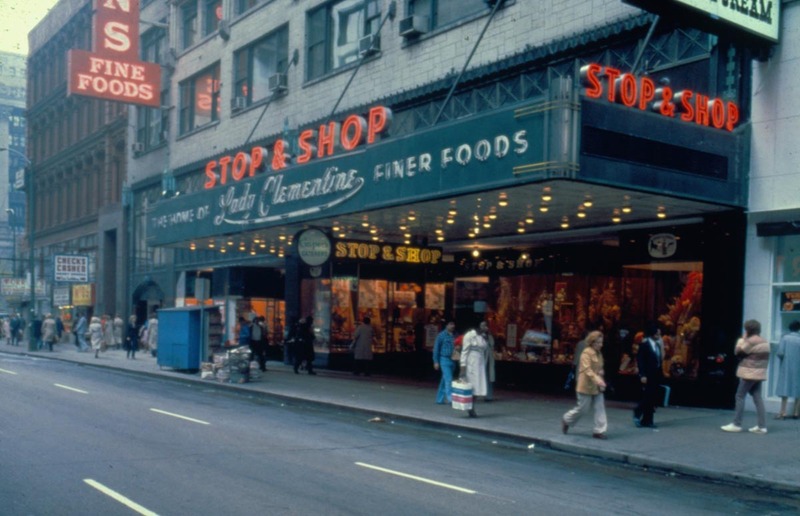 I always recall the example of Stop N Shop on Washington Street in the Loop. Until the early 1980s, it was a rare and wonderful downtown grocery with all of the finest delicacies – I remember gigantic chocolate-dipped strawberries in an era before strawberries all became gigantic (steroids?). Stop N Shop was a real treat and a beloved place. It also occupied a stunning 1930 Art Deco building, but the entire block was slated for redevelopment. Now, you would have a problem demolishing a lovely store with positive associations, so Stop N Shop was closed, and a discount men’s clothing store (two pairs of fuschia trousers for $10!) was put in its place for a few years. By the time demolition came around, no one was bothered by losing the cheap pants – but they would have been upset about the chocolate-dipped strawberries. Back to Cook County Hospital. 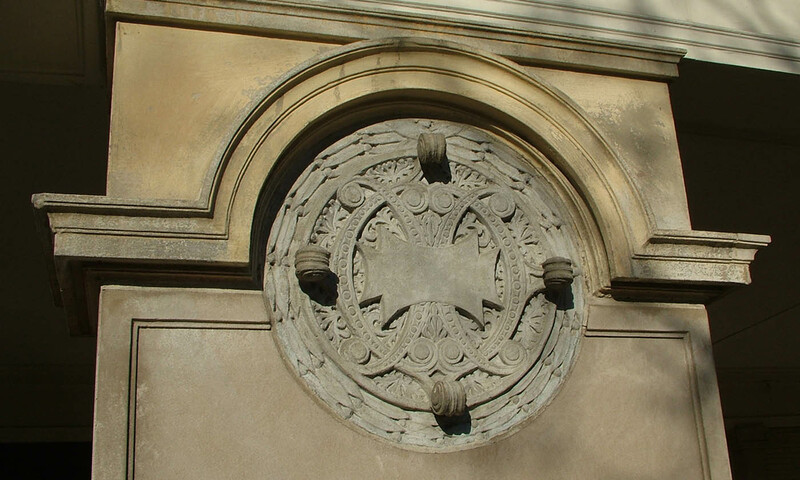 We also have the aesthetic issue, and here the hospital’s grand Beaux-Arts facade with paired fluted columns, elaborate terra cotta ornament featuring garlands, cartouches, human and animal sculptures and grand arched entrances proves worthy. Not only that, but compared to the refrigerator box that is the new Stroger Hospital, the Classical detailing and refined proportions began to look better and better. I suspect that if the new hospital had a more felicitous design, the rapture people developed with the old hospital might not have been as intense. Photo by Antunovich Associates courtesy Landmarks Illinois. Now, the other intriguing aspect of rehabilitating historic buildings is of course the economic aspect. The County Board did dither about the cost – apparently $23 million more (about 20 percent) to rehab rather than to demolish and build new. Ignoring the social and environmental costs of those 900 trucks of debris, this aspect of course triggers a familiar response – preservation costs more. Does it? 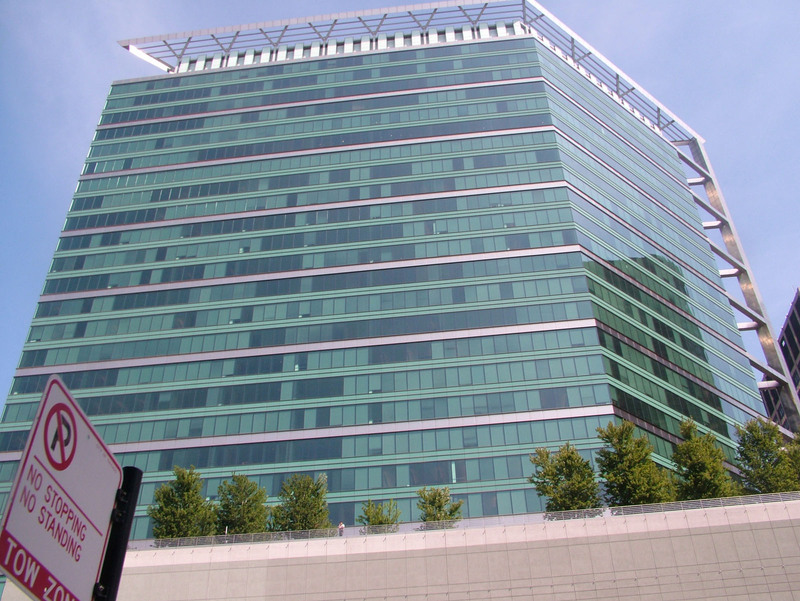 Demolition and a new office building would cost $85 million instead of $108 million, which is more IF both buildings do the same job for the same period of time. Which I doubt. 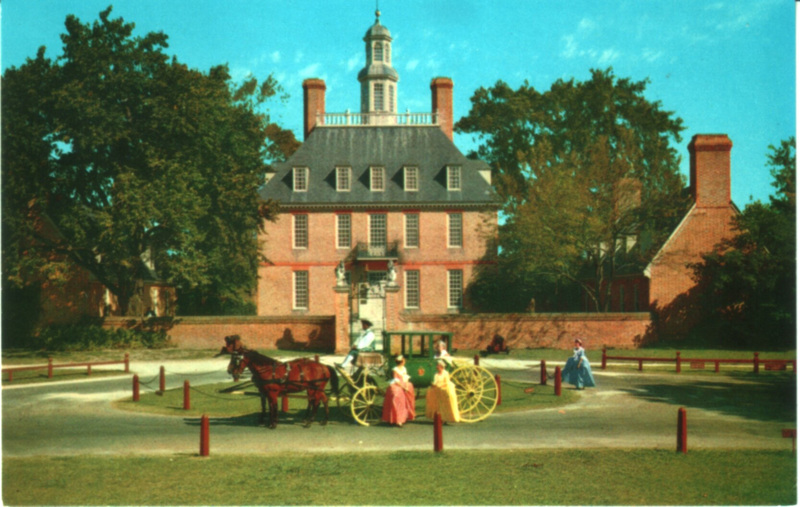 Old buildings, like old windows, are generally built with stronger materials than modern ones. Beyond structure, this is a gut job, and the big cost is that decorative facade, accounting for 80 percent of the cost differential. They are talking about TIF financing, an overused tool, but if they were to make it a private building it would immediately be eligible for tax incentives which would make up the entirety of the difference. Just like preservation tax incentives are intended to do. But comparing a lovely old Beaux Arts landmark with a new refrigerator box is like comparing apples and Tupperware. There is a functional comparison, but the new building would NOT have a decorative facade. Would it need one? No, but you never NEED beauty or grace in life, do you? The fact is we ALREADY have a decorative facade and we know it looks good – much better where it is than in a landfill. This building got a lot of public support in the eight years it took demolition to turn into rehabilitation. 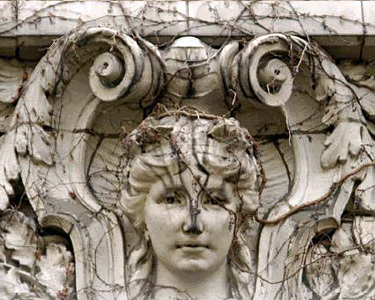 And it is prominent – this building has a giant plaza in front of it and then an expressway – it is a face of the city and deserves to be preserved as much as other faces of the city like Michigan Avenue or Lake Shore Drive. You are currently browsing the Time Tells blog archives for March, 2010.